Located on the south shore of Viti Levu, near the town of Sigatoka, the Outrigger on the Lagoon Fiji Resort offers modern amenities with traditional style beside a pristine beach on the Coral Sea. A five-story, 207-room hotel and 47 Fijian bures (bungalows) provide a multitude of lodging options, fostering a something-for-everyone ambience that’s reflected in a dazzling array of amenities, activities, and entertainment options. The resort is built around one of the largest pools in the South Pacific, an inviting oasis with a lazy river, rock-garden features, and food and beverage service by the water’s edge. The Outrigger on the Lagoon won the 2010 AON Fiji Excellence in Tourism Awards for Best Deluxe Accommodation and Frontliner of the Year to Executive Chef Shailesh Naidu. 2010 Trip Advisor Travelers’ Choice Award Top 3 Best for Families – South Pacific. 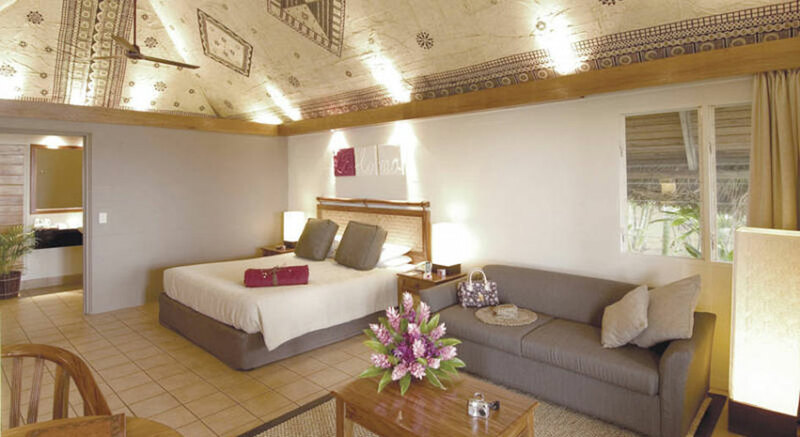 Modern air-conditioned hotel rooms and bures (bungalows) create surroundings reminiscent of a Fijian village. Thatched bures are traditionally designed with vaulted ceilings lined with exquisite hand-painted Masi bark cloth. The resort experience is well suited for business and leisure travelers. Signature Talai Service, traditional five-star butler service with a South Pacific twist, is available to guests staying in Deluxe Ocean View rooms, suites and Bures. Talai Service includes complimentary welcome drinks, and champagne with canapés delivered to your room every afternoon. Talai butlers are available to unpack and press your clothing, recommend tours and activities, and schedule restaurant reservations. All meals and beverages are additional at the Outrigger on the Lagoon. The choices abound…. 9 Dining Choices include the Baravi Bar, Ivi Restaurant (Awarded Best Restaurant – 2006 Fiji Excellence in Tourism Awards), Kalokalo Bar, Meke and Lovo (Fijian Dance and Feast), Sundowner Bar, Takia Bar, Vakavanua Lounge, Vale Ni Kana, In-Room Dining available 24 hours. Let Outrigger on the Lagoon Fiji help you create a romantic island wedding. The lovely new Bure Ni Loloma wedding chapel is situated on a lovely hill top above the resort. Sweeping views of the Coral Coast create a dramatic backdrop for your ceremony. Or imagine your wedding in a lush tropical garden beneath swaying palms or on the beach with the blue Pacific at your feet. Outrigger on the Lagoon Fiji offers these idyllic settings to create perfect memories. A civil or religious ceremony can be arranged, and the minister or marriage celebrant available prior to help you plan your vows. • Child care available 24 hours. 15 FJD for first hour and 10.50 FJD per hour thereafter. • Swimming pool and whirlpool spa. Largest pool in the South Pacific. • Talai butler service 7 am – 11 pm daily for guests in Deluxe Ocean View rooms, suites and bures. Outrigger on the Lagoon Fiji offers flexible accommodations for traveling families and friends. Bure bungalows, suites, and hotel rooms allow three adults OR two adults and two children 12 years or younger. If your party is larger, may we suggest connecting hotel rooms? It’s a great way to have togetherness, privacy, and additional space.